One thing I really like with Season Of Mist is their flair and guts to promote good and 'out of the ordinary' music. Even if they have mostly under their wings some great death, black or gothic bands (Meridian, Mezzerschmitt, Penumbra) they also care for less mainstream metal acts (if there is such a thing) such as Atrox, Tactile Gemma and The Crest for example. Their motto must be quality and variety. 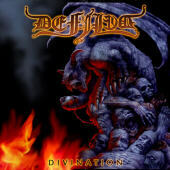 Defiled makes no exception and is a fine new addition to their original catalogue. As already mentioned, Defiled is oriental, more precisely from Japan, land of Concerto Moon, but these guys are really the opposite of that melodic power metal outfit and reside deeply on the dark side of the moon. "Divination" contains 14 tracks of the most unusual type of technical death metal. On most of the compositions (12 out of 14), they execute a fast, hectic and acrobatic death metal with an amazing control and style like we don't get to hear too often. The percussions are like a demolition derby pounding a relentlessly savage beat. The rhythm is unstoppable. The riffing is bone crushing and grandiose. The vocals are demoniac, using at times odd samples and effects. All this being driven by a Prog musical vehicle! Total madness! The bass lines are either loud and strong or nicely clean. On 'Floating Sediment' you'll have the chance to hear it doing a solo on this short instrumental. Short are the compositions (2-3 minutes) adding to the deranged décor. Always intricate, never easy, thrilling and breathtaking just like the following killers: 'The Dormant Within', 'Dissolved in Dust', 'Enraptured'. Bottom Line: For a mature audience in need of utter madness.